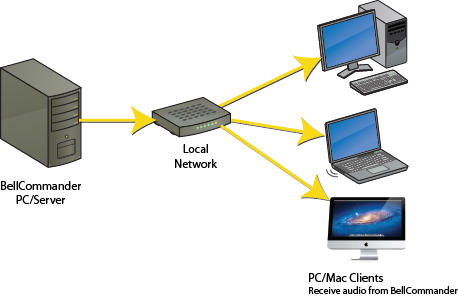 The client PC configuration allows multiple zones to be created for sending different audio to different areas of a building or multiple buildings. The PC running BellCommander should be connected to the network at all times. The client PCs are PCs around the organization which are installed with a small client application. The BellCommander software sends audio to each client PC when scheduled or when the intercom function is used. This configuration is ideal for schools with PCs in each classroom and the total cost is much less than a hardware solution.